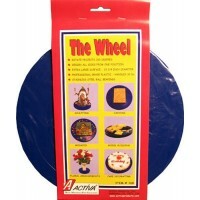 Professional Grade Plastic Sculpting Wheel From Activa - Great for Carving, Sculpting, Mosaics, Model Building, and More! The Wheel can hold up to 30 pounds and has a 10 3/4 inch diameter for all your pottery needs. The size also allows The Wheel to be stored easily and conveniently. It features free-wheeling ball bearing action and the industrial-grade plastic construction is rust-proof an..